The Freie und Hansestadt Hamburg (Free and Hanseatic City of Hamburg) is the second-largest city of Germany and as a city state one of the federal states of the country. Hamburg has a population of about 1.74 million (2005). The oldest traces of human settlements date from the 4th century BC. Between the 4th and 6th century Saxon settlers moved into this area. A church was built here by Charlemagne in 810 AD and the castle Hammaburg was founded to protect this church. The bishopric of Hamburg was founded in 831 by Charlemagne's son, Emperor Ludwig I ("the Pious"). Soon after that, the bishopric ebcame an archdiocese. Shortly after the partition of the Frankish Kingdom in 843, the region was attacked by Vikings and the Slavic Obodrites, and the archbishops moved their seat to Bremen. In 1189 the town obtained the privilege of a harbour town and since then developed into one of the most prominent trading places of the Middle Ages. The massive fortifications that were constructed between 1616 and 1625 protected the town during the Thirty Years' War (1618–1648). The last meeting of the Hanse federation of trading towns took place in Lübeck in 1669 and was attended by the only remaining Hanseatic towns: Hamburg, Lübeck, Bremen, Danzig (now Gda&nacute;sk), Rostock, Braunschweig, Hildesheim, Osnabrück and Cologne. Even after the decline of the Hanse federation, Hamburg remained the most important centre of commerce in Northern Germany. In 1769 Hamburg obtained the rank of a Free Imperial City. In 1804 the fortifications were put down, but already in 1806 Hamburg was occupied by French troops. 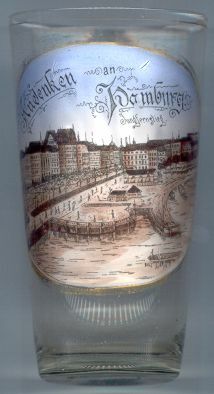 In 1810/1811 Hamburg (in French: Hambourg) became the capital of the French département Bouches-de-l'Elbe. In 1813 the city was occupied for a short period by Russian troops. The Russian army returned in the following year and the French troops were forced to leave the city. The Congress of Vienna confirmed the sovereignty of the city of Hamburg, which joined the German federation and since 1819 holds the title "Freye und Hansestadt". During the late 19th century up until the beginning of World War I the population of Hamburg tripled from about 300,000 to about a million. Villages in the surroundings of the old town grew to become densely populated suburbs and the city's economy boomed. Hamburg's harbour was a centre of Germany's oversea trade and also benefited from its position as a base of the German Imperial Navy. Hamburg earned its nickname, "Tor zur Welt" ("gateway to the world") as it was also one of Germany's most important harbour for passenger ships, especially for those sailing to America. Between 1815 and 1934 about 50 million people left Europe for America, 5 million of those alone via Hamburg. The Greater Hamburg Act (Groß-Hamburg-Gesetz, Gesetz über Groß-Hamburg und andere Gebietsbereinigungen, Law regarding Larger Hamburg and other territorial readjustments) of 1937 changed the geographical extension of the city considerably. Altona, Wandsbeck (Wandsbek) und Harburg-Wilhelmsburg (see below) and other Prussian communities were incorporated into Hamburg. In return, Cuxhaven and Geesthacht became part of Prussia. Hamburg increased its area from 415 km² to 755 km². One year later, all communities that had become part of Hamburg were incorporated into the unified municipality of Hamburg. World War II brought severe hardships for the city. The bomb raids of July and August 1943 killed between 40,000 and 50,000 people and injured some 125,000; about one third of the city was destroyed, about 900,000 people became homeless. After the war, Hamburg was delivered without struggle to the British forces. In 1949 Hamburg became a federal state of the Federal Republic of Germany. The Hamburg Town Hall is the seat of the 'Bürgerschaft', the city parliament, and the 'Senat', the government of the city of Hamburg. The old town hall, which was located at the bridge Trostbrücke, was destroyed by the large fire of 1842. The area between stock exchange and the Kleine Alster was chosen as location for the cosntruction of the new town centre. The first drafts for the design of the new town hall were alread made in 1854 and 1876, but it took until 1884 that the designs were accepted by the city. The cosntrucion of the town hall then took until 1897. The plans were drawn by a group of architects lead by Martin Haller who collaborated with Leopold Lamprecht, Bernhard Hanssen, Wilhelm Meerwein, Hugo Stammann and others. The building is one of the few fully preserved examples of Historicist architecture in Germany. The front façade has a width of 111 m, the central tower has a height of 112 m. The façade is decorated by 20 statues of emperors of the Holy Roman Empire, starting with Karl I (Charlemagne) and ending with Franz II (Franz I as Emperor of Austria). The Jungfernstieg forms the southern bank of the Binnenalster. It originated in 1235 when Count Adolf IV of Schauenburg and Holstein built a dam to pile the waters of the Alster river to drive a mill. After the large fire of 1841 the course of the river was altered artificially. Whereas the old course of the Alster went via what today is the Nicolaifleet, the river was now diverted through an old moat of the former fortifications towards the Kleine Alster. The Lombardsbrücke separates the Binnenalster from the Außenalster and was built on the site where parts of the former fortifications stood. The name is derived from the pawnbroker's house "Lombard" of 1651. Originally the bridge was only a wooden construction, which was replaced by a stone bridge in 1865 as part of the rail connection between Hamburg and Altona. The bridge (total length 69 m) crosses the river in three spans. In 1902 the bridge was widened from 32 to 48 m.
The Kaiser-Wilhelm-Denkmal (monument for Emperor Wilhelm I) [left, no. 2057: bottom right picture] was erected in 1903 on the market square in front of the town hall. The sculptor was Johannes Schilling. In 1929 the monument was moved to the square Sievekingplatz. The Seewarte (naval observatory) [right, no. 2058: bottom right picture] was built in 1881 on the Stintfang. It was the seat of the North German Naval Observatory (Deutsche Seewarte) which had been founded in 1875. The building was destroyed in 1945. In its place a youth hostel was built after the war. The Naval Observatory was superseded by the German Hydrographic Institute (Deutsches Hydrographisches Institut (1945–1990) and then the Federal Maritime and Hydrographic Agency (Bundesamt für Seeschifffahrt und Hydrographie). The bridge depicted in fron of the Seewarte is the Kersten-Miles-Brücke, built in 1887 and named for the mayor Hamburg of 1378–1420. The Hauptbahnhof (Central Station) [left] was built in 1900–1906 in place of the former town fortifications and the cemetery 'Vor dem Steinwall'. The competition of 1900 for designing the station of was won by the architects Heinrich Reinhardt and Georg Süßenguth from Berlin. However, they had to work over their plans because Emperor Wilhelm II had considered their first plan as 'simply awful'. The technical design was made by Ernst Moeller. The new design was even more monumental and emphasized the wide span (73 m) of the concourse. During World War II the station building suffered severe damages but it was restored after the war. With about 400,000 passengers per day it is Germany's busiest railway station. The two other pictures on glass no. 2560 show a view of the Seewarte [bottom left] and a view from the Lombardsbrücke [bottom left] (see further above for descriptions). The St. Pauli Landungsbrücken (St. Pauli Landing Stages) [left, no. 2879], part of the Hamburg Harbour, are located in the quarter St. Pauli of Hamburg between the lower harbour and the Fischmarkt (Fish Market) directly on the Elbe River. There is an entrance to the Old Elbe tunnel directly at the western end of the Landungsbrücken. The eastern end of the building complex is marked by the Pegelturm (water level tower). The first pier here was built in 1839 at what was then the edge of the harbour. It served as a terminal for steamships, which could be relatively easily filled with coal here. The pier ensured a sufficient security distance from the city, since these ships were fueled by coal which presented a fire risk. The current piers built in 1907 consist of floating pontoons, which are accessible from land by ten movable bridges. The 688-metres-long landing place originally served the passenger steamers of the overseas lines. Among others, the great Hapag-Lloyd liners landed here. Today only the HADAG ferries, harbour tour ships and motor launches, passenger ships serving the lower Elbe, and catamarans to Stade and Helgoland still travel to the piers. The old piers were destroyed during World War II, so today's pontoons were rebuilt between 1953 and 1955. The last section destroyed in the War, between bridges 2 and 3, was not rebuilt until 1976. During the modernisation begun in 1999, the roofing and lighting were updated. Part of this modernisation is planned to include replacing bridge 7. The Bismarck-Denkmal (monument for Otto von Bismarck) [left, no. 2310] was inaugurated in 1906. WIth a total height of 34 metres (statue 15 metres, pedestal 19 metres) it is the tallest monument in Hamburg. The Berlin sculptor Hugo Lederer created the statue in 1903–1906, using granite blocks from the Black Forest. Bismarck, the founder and first chancellor of the German empire, is shown looking out to the sea and supporting himself on a sword, which is an allusion to medieval 'Roland' figures, the symbol of free cities. The figures on the pedestal, symbolising the German tribes, were created by Lederer and the architect Johann Emil Schaudt. The monument is probably the best-known of all Bismarck monuments. It is located in the Elbpark near the jetties of St. Pauli. The site was occupied in old times by the bastion 'Casparus' of Hamburg's old fortifications. Inside and underneath the monument there is an extensive system of chambers and catacombs, which during World War II were used as air raid shelters. Due to security reasons, the interior is not accessible to the public any more. 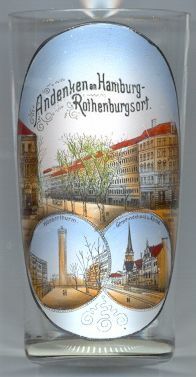 Several glasses of this collection show other Bismarck monuments. Altona is the westernmost urban borough (Bezirk) of the German city state of Hamburg, on the right bank of the Elbe river. It was founded in 1535 as a village of fishermen. In 1664 it received city rights from Danish King Frederik III. Until 1864 Altona was one of the Danish monarchy's most important harbour towns. The railroad from Altona to Kiel, the Christian VIII Baltic Sea Rail Line (Christian VIII Østersø Jernbane), was opened in 1844. The wars between Denmark and the Kingdom of Prussia like the First Schleswig War (1848–1851) and the Second War of Schleswig (1864) followed by the Gastein Convention (1865) led to Denmark's cession of the Duchies of Schleswig, Holstein and Lauenburg to Prussian and Austrian administration, respectively. Following the Austro-Prussian War of 1866, the Peace of Prague (1866) and the Treaty of Vienna (1866) Schleswig and Holstein were annexed by Prussia. The Greater Hamburg Act took Altona away from the Free State of Prussia in 1937 and merged it (and several surrounding cities) with the Free and Hanseatic City of Hamburg in 1938. On February 1, 2007 the precincts (Ortsämter) in Hamburg were dissolved. Politically, the following quarters (Stadtteile) are subject to the Altona borough: Altona-Altstadt, Altona-Nord, Bahrenfeld, Ottensen, Othmarschen (including parts of Klein Flottbek), Groß Flottbek, Osdorf, Lurup, Nienstedten (including parts of Klein Flottbek), Blankenese, Iserbrook, Sülldorf, Rissen, Sternschanze. The Altona Town Hall [left] was built in 1844/45 as station building of the Altona–Kiel Railway Company. Side aisles were added in 1890. In 1898, after the station was moved to a new location about 500 metres further north, the building became the new (chronologically third) town hall of Altona. Altona was incoporated into the city of Hamburg in 1938, and after World War II became the seat of the administration of the city district Altona. The Altonaer Museum [right] was founded in 1863 as the municipal museum for the independent town of Altona/Elbe. In 1888 the museum was taken over by the city's administration. The building depicted on glass no. 2460 was built in 1901. The museum's main focus were the natural and cultural history of Schleswig-Holstein. Due to its great popularity, the museum was extended in 1914, for the occasion of the 250th anniversary of Altona. In the 1970's the city council of Hamburg decided to move the natural history exhibits to the Hamburg University, the exhibits on prehistory and prothistory were given to the Helms Museum. In 1980 a large fire destroyed parts of the building and the remaining exhibits. Thereafter, the museum was reoriented, the exhibition space was greatly enlarged and now also uses the neighbouring building, the former watchmaker's school that was built in 1928. Blankenese is one of Hamburg's suburbs at the northern bank of the Elbe river. It is part of the city's borough of Altona. Blankenese covers an area of 8.3 km² and has a population of about 13,000 (2005). Blankenese was first mentioned in 1301. The name Blanke Neeß ('white nose') refered to a small, flat peninsula that reached out into the Elbe river, but later, in 1634, was washed away by a storm tide. The fishermen's village originally it was part of the county Holstein-Pinneberg, later of the duchy of Holstein. From 1460 onward, Holstein was ruled in personal union with Denmark. In 1866 the country became part of Prussia (Province Schleswig-Holstein). During the 19th century Blankenese became a mainly upper middle class residential area. In 1919 Blankenese was amalgamated with the neihbouring community of Dockenhuden. Following the Greater Altona Act (Groß-Altona-Gesetz) of 1927 Blankenese was merged with the city of Altona/Elbe. Together with Altona, Blankenese was incorporated into Hamburg following the Greater Hamburg Act (Groß-Hamburg-Gesetz) of 1937. The picture on glass no. 1174 [left] shows the Süllberg (74.7 m). Originally, the hill was completely covered by a dense forest. In 1031, the archbishop of Hamburg and Bremen cleared the hilltop and had it fortified. Around 1250 a new castle was founded on this spot, but was destroyed in later years. The first inn on the hilltop was opened in the 19th century and due to the wonderful view became very popular. Rothenburgsort is a quarter in Hamburg's borough of Hamburg-Mitte. It is located between the Norderelbe and Bille rivers. In 1943 Rothenburgsort was almost compeltely destroyed by Allied bomb raids. The top picture on glass no. 1070 shows the street Kleiner Röhrendamm. The bottom left picture shows the water tower in Billhorner Röhrendamm. The water tower was built around 1850 by William Lindley who had modernized the water supplies of Hamburg. The facilities now house the Hamburg Water Museum. The bottom right picture shows the Gemeindehaus (parish hall) and the Lutheran church of Sankt Thomas in Billhorner Röhrendamm/Vierländer Damm. The church was built in 1885 and was largely destroyed in 1943. The nave was rebuilt in 1957. Uhlenhorst is a quarter in Hamburg's borough of Hamburg-Nord. The Uhlenhorster Fährhaus was built in 1873 (in place of an earlier country inn), and was destroyed during World War II in 1943. It was once a popular restaurant/café for day trippers and paddlers on the Außenalster. The former island Neuhof is located east of the Köhlbrand, a delta distrubutary of the Süderelbe where it flows into the Norderelbe. The smaller northern part of Neuhof is part of the quarter of Steinwerder, while the larger southern part belongs to the quarter of Wihelmburg, both in the borough of Hamburg-Mitte. The Köhlbrand originated in the 14th/15th century following a series of storm floods which divided the former island of Gorieswerder into several smaller islands. The banks of the Köhlbrand became the site of many charcoal piles, which became the rigin of the river channel's name. In 1908, following the 3rd Köhlbrand Treaty between Prussia and Hamburg, the river was regulated, deepened and transfered to a new bed about 600 metres west of its original location. Since then the Köhlbrand is the main effluent of the Süderelbe into the Norderelbe. Presently, it has a mean width of 300 metres and a mean depth of 8,4 metres. Since 1974, the Köhlbrandbrücke spans the Köhlbrand and connects the quarters of Steinwerder and Waltershof. Its clearance height of 53 metres allows the passage of large sea ships. Harburg is one of the seven boroughs of Hamburg, located in the southwest of the city. It covers about 161 km² (21% of the area of Hamburg) and has a population of about 196,000. The origins of Harburg go back to about 800 AD. The earliest written mention of Horeburg ('castle in the swamp') is found in a document dating from 1142. Until 1937 Harburg was part of Hannover (Electorate Braunschweig-Lüneburg, from 1814 Kingdom of Hannover, from 1866 Prussian province Hannover). In 1927 Harburg and the neighbouring town of Wilhelmsburg were amalgamated into the city of Harburg-Wilhelmsburg which formed a separate administrative district. Nevertheless, Harburg remained the seat of the district administration for the rural district Harburg as well. Like Altona, Wandsbek and other communities, Harburg-Wilhelmsburg in 1937 was incorporated into the city state of Hamburg following the Greater Hamburg Act (Groß-Hamburg-Gesetz). In the following year all of the more or less independent communities within Hamburg were amalgamated into the unified municipality of Hamburg. In 1944 the historical centre of Harburg was almost completely destroyed. As a consequence, the seat of the district administation for the (rural) district Harburg, which is not part of the state of Hamburg, was moved to Winsen (Luhe). The town hall of Harburg [left] was built in 1889–1892 by the architect Christoph Hehl in a Historicist Renaissance revival style. The characteristic tower was destroyed in 1944 and was not restored after the war. Today, the former town hall houses the administration of the borough of Hamburg-Harburg. The old Elbe bridge at Harburg [right] was built in 1897–1899. It consisted of an iron construction of four arches, with two sandstone porches, and was the first bridge across the Elbe that enabled coaches to cross the river. The bridge was renovated between 1980 and 1995. Today it is used only as a pedestrian bridge. The steamship "Deutschland" [left] was built from 1898 in the Vulcan shipyards of Stettin (now Szczecin, Poland) for the HAPAG (Hamburg-Amerikanische Packetfahrt-Actien-Gesellschaft) line in order to give the line a new, fast ship that would outperform its competitors from the Norddeutscher Llyod and White Star lines. 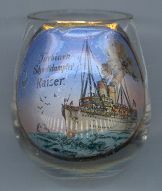 The "Deutschland" was launched on the 10th of January 1900. Already on its maiden journey the ship won the Blue Ribband on the 4th of July of that year with a mean speed of 22.42 knots and a journey time of 5 days, 15 hours and 46 minutes. The Blue Ribband for the westbound journey was taken by the "Kronprinz Wilhelm" of the Norddeutscher Lloyd (see Bremerhaven) in 1902, but could be regained by the Deutschland in the following year. One of the main problems of the ship were heavy vibrations at high speeds which caused the loss of the rudder and the breaking of the cast-iron stern post in 1902 during the return journey from New York to Hamburg. Because the ship also was unprofitable since it required so much coal as fuel, the ship was decommissioned in 1910 and was remodeled into a cruise ship with less engine power. The new ship, the largest cruise ship of its time, began its service on the 23rd of September 1911 under the new name "Viktoria Luise". During World War I the ship was rebuilt into an auxilliary cruiser, but it never was put into service due to insufficient power of the boiler units. Because of her bad technical condition, the "Viktoria Luise" was the only large German ship that was not claimed as reparation by the victorious powers and which remained under German flag. During a thorough remodeling in 1921 two of the original four funnels were removed and the ship continued her service under the name "Hansa". In 1925 the ship was finally scrapped at the Vulcan shipyards of Hamburg. The steamship "Kaiser" [near left] was built in 1905 at the Vulcan shipyards in Stettin (now Szczecin, Poland). The ship was originally commissioned by the Hamburger Nordsee-Linie. However, already before the ship could take up its service the company was taken over by the HAPAG line. The "Kaiser" was the first ship built in Germany that used turbines for propulsion. Until 1914 she was used in the North Sea serving on the route from Hamburg to Helgoland and Sylt, and in the Adriatic between Genova and Nice. During World War I the ship was used for casting mine barriers. For tactical reasons the aft funnel was removed to alter the ship's silhouette. After the war the ship was restored but had to be handed over to Great Britain as reparation. Since the British had no use for the ship, it was repurchased by the HAPAG line which in 1921 had the "Kaiser" remodeled at the Vulcan shipyards of Bremen. At this occasion, the aft funnel was removed for good and the power of the ship was decreased. Until 1934 the ship again served on the line from Hamburg to Helgoland. After 1934 it was used in the Baltic Sea. During World War II the "Kaiser" served military purposes. In 1945 was ceded to Great Britain again, but in the following year was handed on to the USSR. The ship was at first renamed "Nekrasov" and later, in 1948, "Beniowski" after having been transfered to Polish ownership. For a short while the ship was used on the route between Sopot, Gdynia and Szczecin. In 1949 the ship was recommissioned as a training and boarding ship by the maritime school of Gdynia. In 1954 the ship was finally scrapped in Szczecin. The steamship "Amerika" [near left] was built in 1905 for the Hamburg-Amerika (HAPAG) line by Harland & Wolff shipyards, Belfast. Launched on 20 April 1905, her maiden voyage on 11 October took her from Hamburg via Dover and Cherbourg to New York. In many ways the "Amerika" resembled the Harland & Wolff White Star liners "Celtic" and "Cderic", alhough she was considerably more luxurious. Her passenger accommodation, far ahead of any predecessor included such refinments as suites with a private bathroom, electric lifts, a winter garden, electrical medicinal baths and a Ritz-Calton restaurant (the first à-la-carte resturant on the North Atlantic). She was a 22,225 gross ton ship, length 669 ft × beam 74.3 ft, with two funnels, four masts, twin screw and a speed of 18 knots. There was passenger accommodation for 386 First, 150 Second, 222 Third and 1,750 Fourth Class. In June 1914 the "Amerika" inaugurated a Hamburg - Boulogne - Southampton - Boston service, but already in August of that year she was interned in Boston. Seized by the US in April 1917, she was turned over to the US Navy. Renamed "America", she became a Navy Transport and sailed on nine trooping voyages from the USA to France. From February 1919 on, the "America" was back in service for the US Shipping Board. She sailed from New York via the Panama canal to Vladivostock, then embarked 6,500 troops for Trieste sailing via Suez. Overhauled and refitted in 1920 she returned to the New York - Europe service under charter to United States Mail Steam Ship Co. Tranferred to United States Lines in August of that year, the "America" sailed on the New York - Bremerhaven service. Converted from coal to oil-firing in 1921 at Brooklyn, she was refitted to carry 225 First, 425 Second Class, 1,500 Third Class, sailing New York - Plymouth - Cherbourg - Bremen service. After a refit in 1926, a large fire swept through the ship and demolition was considered. Insted she was repaired and returned to between New York and Bremen. After her final transatlantic voyage in 1913 she was laid upat Hoboken, NY, and was towed to Chesapeake Bay for lay-up, September 1932. In October 1940 she was towed to Baltimore for conversion to an accomodation ship for US Maritime Commission in St. Johns, Newfoundland, and was renamed "Edmund B. Alexander", while the name "America" was transferred to the newest and largest United States liner. In 1941, the "Edmund B. Alexander" was again fitted out as a troop transport and began trooping from New Orleans to Panama. By 1942, her aging engines were giving only 10 knots. The US Maritime Commission sent her to Bethlehem Steel Corp. in Baltimore for an overhaul which included removing one funnel. In April 1943, she was transferred for use as US Army transport. In 1949, laid up at Baltimore, then laid up on Hudson River in 1951. In 1957 she arrived at Bethlehem Steel Corp. in Baltimore for demolition where she was finally scapped in 1958. Several glasses of this collection show other ships.